What happened to the simple oil change? With tighter emissions and fuel mileage requirements the 3,000 mile/3 month oil change has gone the way of the Dodo bird. Manufacturers have lengthened oil change intervals using oils that meet their specifications. This is good for the consumer as it reduces trips to the service shop, and is good for the environment by reducing the volume of used oil in the waste stream. And it is actually better for the engine. 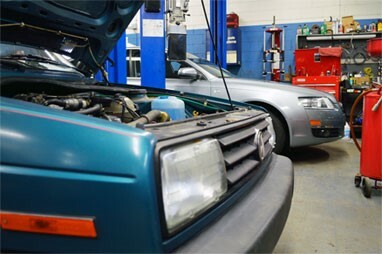 Our Volkswagen Jetta shuttle car has over 283,000 miles miles on it with no problem using factory approved oil and a 10,000 mile oil change interval. We use only the highest quality oils that are approved by the company that manufactured your car. Need Help Choosing the Right Oil? Oil is oil right? Conventional wisdom says that synthetic oil is the best for your car. Some of you may already know this, but there are different categories of synthetics and mixing them could prove detrimental to the health of your engine. European oil standards are much more stringent than those of domestic or Asian manufacturers. For instance using synthetic oil, which is approved by an Asian manufacturer for its own fleet, in a BMW, VW, Audi, Porsche, etc. could end very badly. Camshafts are the most at risk part of the engine and synthetics formulated for Asian or domestic cars are not up to the task of handling the high loads the Europeans require. Oil standards as well as the oil change interval are listed in your owner’s manual, and there is no value in changing oil sooner than the manufacturer specifies. Our shop car, which has 283,000 miles on it, gets an oil change every 10,000 miles as suggested by VW. The approval ratings can be found on the oil container. If the ratings on the container don’t match the approval ratings in your owner’s manual, don’t use it. By the way, if XYZ oil has the same approval rating as Mobil 1, that means it has been approved for use in a particular engine. So, if it costs less, by all means, use it. If you are the engineer type and want to know more, please contact Troy at 717-285-3738 or troy@roberts-automotive.com, and he will send you some information that will keep you busy for a couple of days. Schedule your oil change service today, 717-285-3738.